YOU HEARD THE RUMOUR MILL BUT HERE IT IS IN RED, WHITE AND BLUE. WE WILL KICK OFF EARLY ON SATURDAY THE 30TH, 7am to 12:00pm (cause somebody stuck the 4th on a Wednesday). 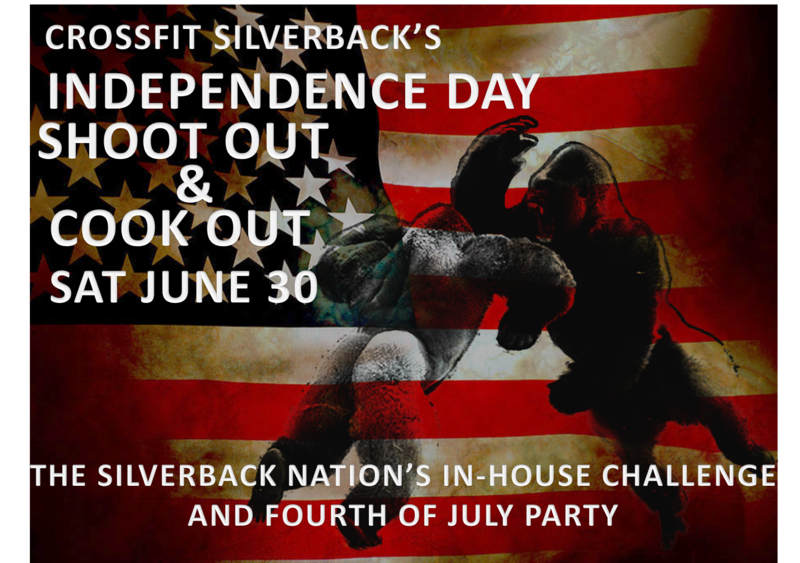 IF YOU HAVE EVER WONDERED WHAT ITS LIKE TO DO “COMPETITIVE” CROSSFIT THIS IS YOU CHANCE TO CHECK IT OUT IN THE FAMILIAR SURROUNDINGS OF THE SILVERBACK NATION. WE WANT ANY AND ALL SILVERBACKS TO COME OUT AND SEE HOW THEIR STRENGTH AND SKILLS STACK UP WITH WOD’S FROM PAST COMPETITIONS AT OTHER AFFILIATES AND ASSESS WHAT IT WOULD TAKE TO GO TO THE NEXT LEVEL. IF YOU HAVE ANY CURIOSITY ABOUT COMPETITIVE CROSSFIT ON THE LOCAL LEVEL OR HIGHER THIS IS A GREAT OPPORTUNITY. LOVE THE IDEA BUT DON’T FEEL READY? WE COULD STILL USE YOUR HELP AS A JUDGE AND SPECTATORS ARE DEFINITELY SOMETHING THAT MAKES COMPETITIONS FUN. JUST SIGN UP AT THE BOX!!!! I will not be participating but would be happy to lend a hand wherever needed. You would make an awesome judge and sous chef sir.